for people who suffer from pain. Osteopathic PDX is a micro-practice dedicated to patient-centered care. The setting is mindful, timely, and unhurried. During your visit, you will have ample time to get to know Dr. Esmer, while he takes the time to address your concerns, establish the diagnosis, and provide treatment. Board certified in Osteopathic Manual Medicine, Greg Esmer, D.O., uses a range of approaches to restore health to those suffering from pain. While his comprehensive training in Western medicine includes performing surgery, prescribing medication and interpreting MRIs, Dr. Esmer focuses on non-invasive treatments. These include osteopathic manual treatment, injections, postural training and mind/body medicine. 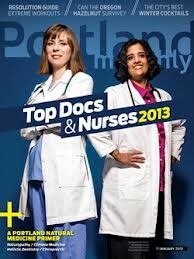 Dr. Esmer was recently voted "Top Doc" by the physicians of metropolitan Portland in Portland Monthly Magazine.